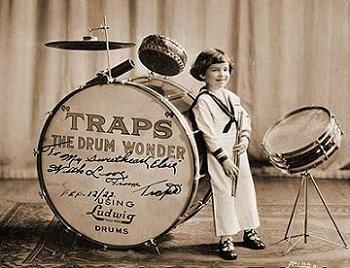 The Mozart of drumset, soloist at four years old (in a show called "the drum wonder"), Bernard "Buddy" Rich went through all history of the drumset from one end to the other by innovating and progressing constantly (he is born in 1917 and died in 1987). His rolls reached a speed that would be legendary if we did not have a filmed trace. Among other typical strokes probably invented by him, the ternary roll (RRL) on stick (a "trick Stick" taken over by Thomas Lang in "Creative Control", it is nevertheless found "ras of 5” stick on stick in the Napoleonic "Marche des éclopés" (“March of the lame men”)), the passages crossing an arm above and below each other in continuous single stroke roll, the roll alternating 3 limbs (right hand-left hand-right foot). In 1966, he recorded with his Big Band (album "Swingin 'New Big Band"), a version of a R'N'B success of the same year, "Up-Tight" by Stevie Wonder. He will then make a jazzy interpretation of the rock drumming with shifted afterbeat and beat ("syncopations"), "rim shots" and "ghost notes", inspiring probably what will be the success of the funk drumming of Clyde Stubblefield with James Brown in 1967 ("Cold Sweat"), or the jazz-rock and fusion much later (Dennis Chambers, Dave Weckl and many others have taken over this rhythm). It also initiates jazz and Indian music mixing (which will make the success of John McLaughlin and Zakir Hussain or Trilok Gurtu, a few years later) in 1968, making a "drum battle" with Zakir Hussain own father, Ustad Alla Rakah (album "Rich à la Rakha"), even if the Beatles had dared to do this mix in 1966, with the rock, in "Love you to" from the album "Revolver" (but without drumset). 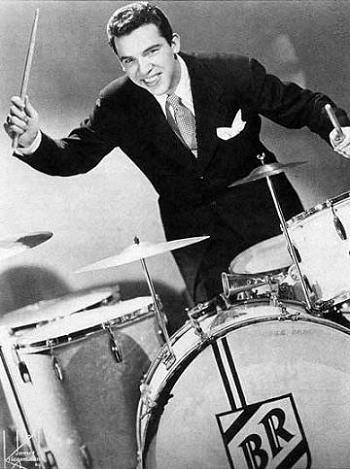 Buddy Rich made with his performances a total entertainment where humor was never far (see video (TV show) with Jerry Lewis duet "drum battle" below). Himself a disciple of Gene Krupa, his most famous disciple will be Louie Bellson with whom he recorded famous drum battles (and also with Max Roach). His name is premonitory because he was for several years the musician the best paid in the world, thanks to his versatility and his extraordinary ear and memory, which allowed him to adapt immediately to any jazz band brilliantly (self-taught, he could not read sheet music as Chick Webb, the "King of swing", whom he admired). 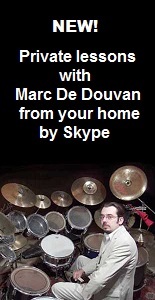 Concerts were set up in his homage, bringing together great virtuosos of the drumset accompanied with his big band (which include notably the drum battle trio with Dave Weckl, Steve Gadd and Vinnie Colaiuta). Many concert videos exist on him, where he always plays long solos.